Dental 3D Printer Buyer's Guide – What does a Dental 3D printer cost? 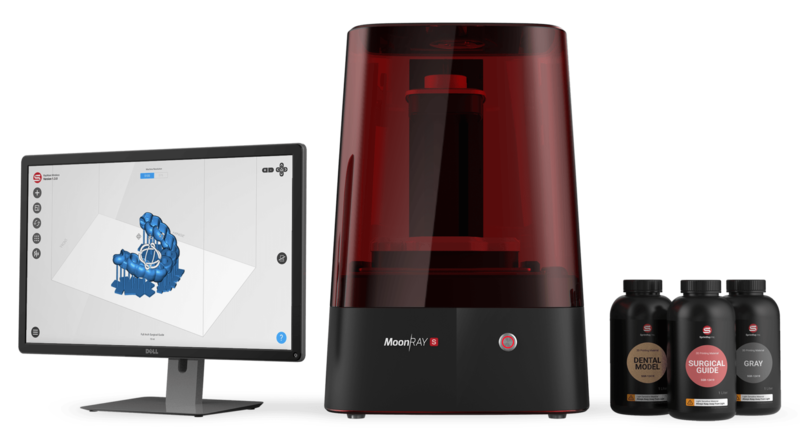 The MoonRay S, a dental 3D printer that can produce functional, finished dental appliances. The widespread proliferation of dental 3D scanners and CAD/CAM treatment planning software has contributed to improved patient experience in dentistry. Broadly conceived, digital dentistry consists of these two innovations as they exist in clinics and labs. But recent currents in the world of dentistry have argued that 3D printers can further improve this paradigm, closing the loop by offering affordable fabrication. 3D printing, in other words, offers an output step to the data capture and design component of digital dentistry via the printed dental appliance. But additive manufacturing is a vast market. 3D printer cost is as low as $500 and as high as $100,000. Industries across the world are adopting 3D printing into their workflows. In 2018, everything from consumer sneakers to professional-level race cars will have 3D printed parts. With a technology that penetrates so many industries, it can be difficult to parse which features and technologies are needed in a dental clinic or lab. Dental prints have to be functional in order to be useful. 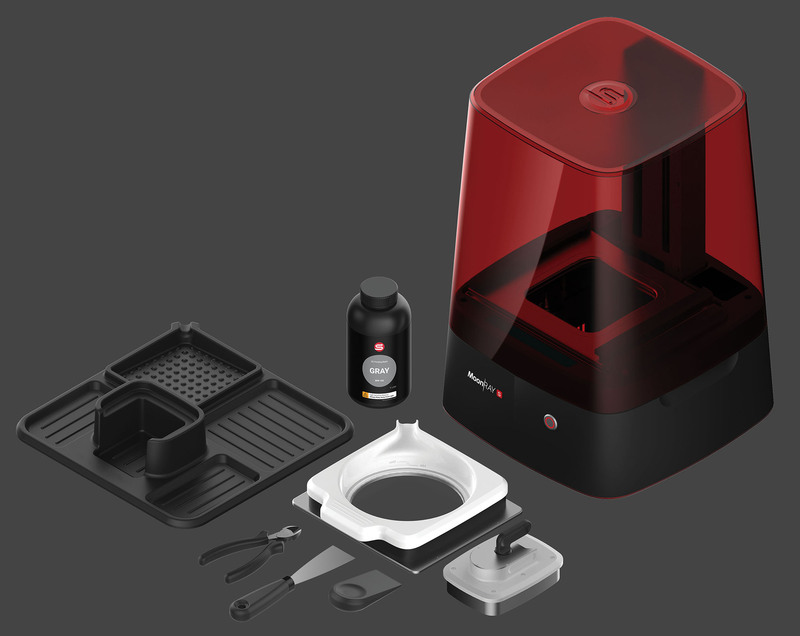 A dental 3D printer has a specific, pre-defined use case: printing functional dental appliances such as clear aligners, monolithic dentures, and nightguards. This is a crucial difference between the way clinics will use 3D printers and the way they’re used in most other industries: dentists produce final, certified products, not just prototypes and models. This means that printed items need to be ready for final delivery with minimal post-processing and maximum polish. For dental clinics and labs, it’s about more than just the cost of a 3D printer. There are many desktop 3D printers on the market that are capable of fabricating beautiful-looking parts. They’ll often feature printed dental models on their websites to showcase their dental chops. Many printers, especially in the range of $5000 and less, claim to be valuable for dentists but cannot create certified, final printed dental appliances. 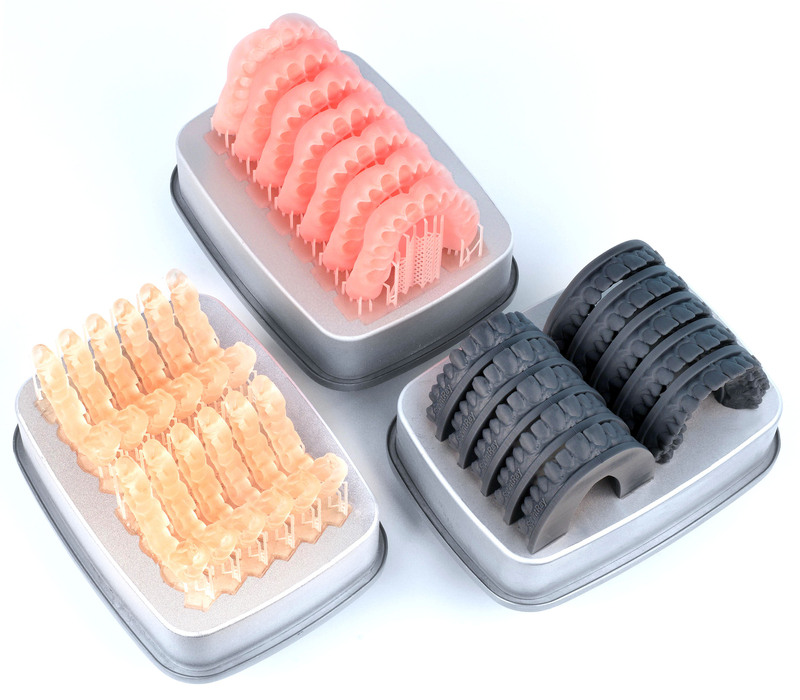 Dental models are useful in creating clear-aligners, but a dental 3D printer should also have the capability to use functional resins to produce applications such as indirect bonding trays, denture bases, and nightguards. There are very few desktop printers that can do this. We aren’t printing jewelry, here. A piece of technology belongs in a dental clinic or lab only if it improves the dental workflow or expands the capabilities of its practice. Many printers can fabricate dental models and surgical guides, but the ability to print final appliances such as IBT, denture bases, crowns, bridges, and nightguards come from the ability to use biocompatible, certified resins. If your 3D printer can’t use certified functional dental resins to fabricate a printed, final dental appliance that is ready for placement, then it is not a dental 3D printer. Desktop 3D printing has become affordable in the last five years, but the cost of a printer can only be justified for a lab or practice if it demonstrates a return on investment. Certain printers are advertised as being built for the dental industry but have extremely limited applications due to aforementioned resin limitations. When considering 3D printer cost, make sure to understand the full scope of the printer’s fabrication ecosystem so that you aren’t limited to just a few applications. A broad application range means that your printer can grow along with your practice, and your investment will continue to return for a long time. Additive manufacturing has reached the mainstream, but even the best pieces of consumer technology still require support. The best 3D printers are those that exist in a support ecosystem specifically for dentistry. An expert in 3D printing who knows nothing about denture bases is going to have a hard time understanding the nuances of prosthodontic requirements for parts in terms of aesthetics and fit. Don’t sit in the general support queue, trying to explain your needs to someone whose primary interest is casting 3D printed jewelry. Dental 3D printers are fast, efficient, and user-friendly. 3D printing in dentistry can be bucketed into two major categories. On one hand are the industrial-grade, high-throughput machines that feature excellent capacity and good quality. While these machines are excellent choices for dental labs that create dozens of appliances per day, their high upfront cost, large size, and maintenance requirements mean that they’re not a practical solution for the in-office printing of dental appliances. They are a great companion in a high-volume lab, but at a clinical level, the industrial 3D printer cost is too great for single practices involved in digital dentistry. Desktop 3D printers, on the other hand, feature excellent quality at a significantly reduced price point and are presented in a much more manageable size: no larger than your average inkjet paper printer. Desktop printers are just as versatile as their larger counterparts but tend to feature smaller build platforms and have lower overall throughput. For the multi-disciplinary general practitioner, oral surgeon, practicing prosthodontist or orthodontist, this kind of desktop dental 3D printer with good throughput will supply more than enough capacity. Fully finished, 3D printed dental appliances. No mail required. Many of the most popular desktop 3D printers on the market today are trying to cash in on the dental market boom. As more dentists put 3D printing into their offices, they follow the money into dental without having products to back it up. While printing dental models and surgical guides are both useful in-office solutions, most desktop printers on the market today cannot print final dental appliances. Many companies are scrambling to add certified dental resin capabilities to their current 3D printer lineup. The simple fact of the matter is that 3D printing in dentistry is exploding. The marketing machines do their jobs well: a cursory look at the most popular printers will give you the impression that any of their machines will dramatically improve your dental workflow. 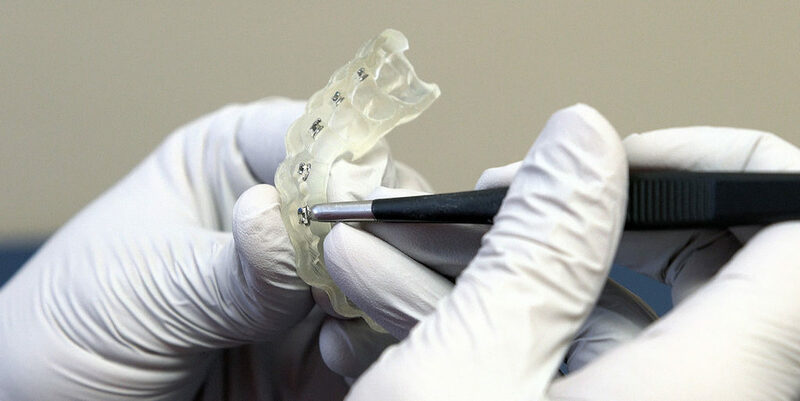 But they lack the ability to print final dental appliances such as dentures, crowns, bridges, and indirect bonding trays. It’s important to look beyond just the individual up-front 3D printer cost, because if it can’t produce a final printed dental appliance with certified biocompatible resin, it isn’t a dental printer. 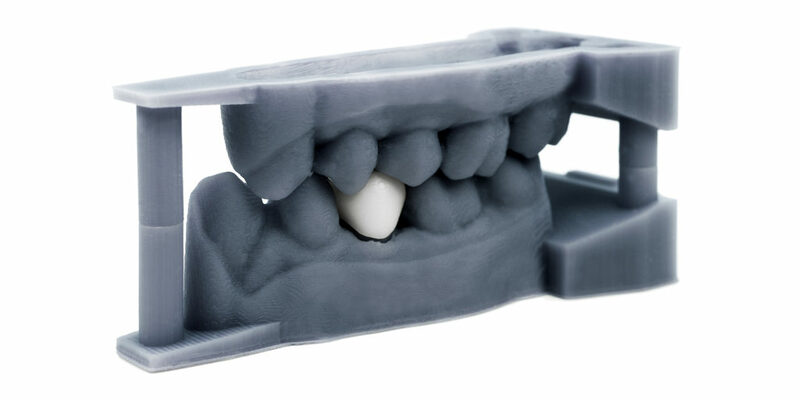 SprintRay builds 3D printers just for dentists. There are a dizzying number of 3D printers on the market that claim to be built for dentistry. While many of these models can print a limited selection of dental applications such as die models, they severely limit your ability to offer expanded treatment. There are, in the same price range, desktop 3D printers that are designed from the ground-up for use in dental clinics and labs. These printers, such as our dental 3D printer MoonRay, are capable of utilizing functional, certified dental resins to produce not just models but final products in the form of the printed dental appliance. Indirect bonding trays, denture bases, crowns and bridges, these are just a few of the additional offerings made possible by printer that uses an open certified resin system for dental. When closing the production gap in your digital dentistry practice, consider that your in-office solution is an investment. As such, you need not just the necessary product for now, but also the capabilities and support to allow it to grow with you into the future. SprintRay’s dental support team, our certified biocompatible resins, and our high-ROI products are built for the next 100 years of dentistry. Dentists all over the world are adopting 3D printing into their practice. As with any technology, the first step is often the most difficult. But digital dentistry is evolving, and the printed dental appliance, created in-office, is the next step forward. Watch Dr. Chetty and Dr. Shao, two general practitioners, talk about their experience with 3D printing. Orthoselect also spoke with us a few months ago about how they use printing in their lab. A new article in Dentistry Today highlights the benefits of 3D printing with MoonRay. The future of digital dentistry is here, and it has come in the form of the desktop 3D printer.